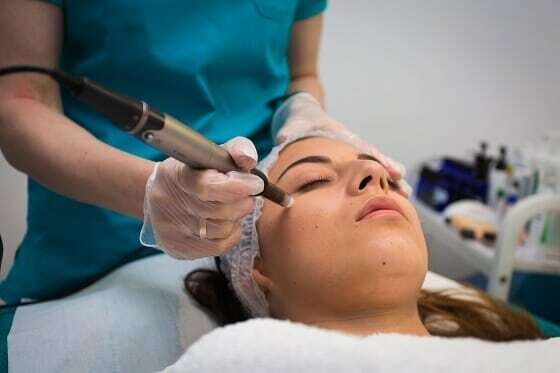 Microneedling – a treatment that helps minimise the signs of ageing, rejuvenate the skin and improve the appearance of stubborn acne and scars. Better yet it’s minimally invasive and delivers exceptional results. Ready to learn more? Microneedling is a popular treatment which involves super-fine needles that are applied with an electric device. The needles penetrate the upper layers of the skin, creating tiny wounds. Why? The wounds signal to the body that it’s time to heal: causing it to produce collagen and elastin fibres. Collagen gives our skin its strength and elasticity; elastin gives skin its remarkable ability to “bounce back” when pinched or pulled. Both of these can diminish as we age. Microneedling spurs production of these key elements, promoting fuller, younger-looking skin. Why Should I Consider Microneedling? It effectively treats a wide array of skin issues, including acne scarring, surgical scarring, lines, wrinkles, hyperpigmentation, age spots, rosacea and more. It is minimally invasive. You can have a procedure at a trusted clinic and go about your day. Recovery time is quick. Sure, the word “wounds” sounds scary, but they are simply very small pinpricks. You will likely experience some mild swelling and/or redness that may feel a bit like a slight sunburn for a day or two. You may also have slight bleeding or bruising. But as a result, your skin will appear revived and rejuvenated. Microneedling improves the effectiveness of your everyday beauty products, such as cleansers, lotions and sunscreens. This procedure is effective on all skin types. Microneedling is less expensive than many other types of resurfacing treatments. It is effective on your face, scalp and body. Dermaroller: In this treatment, thousands of microscopic needs are applied to the skin in horizontal, vertical and oblique directions. Don’t worry: our specialist will start by applying a topical anaesthetic 30 to 45 minutes before the procedure. This typically takes 15 to 20 minutes. Dermapen: This treatment incorporates new technology to minimise bleeding and pain. Micro-needles penetrate the skin at a vertical angle. This method is faster and can be used in smaller areas and those with contours, making it more effective on the face than dermarolling. INFINI 3D: A remarkable option, INFINI 3D Skin Tightening combines microneedling and three-dimensional radio frequency treatments. The needs create micro-holes into which localised radio frequency is introduced. This process tightens and smooths the skin. Ask our expert team which micro-needling solution is best for you!